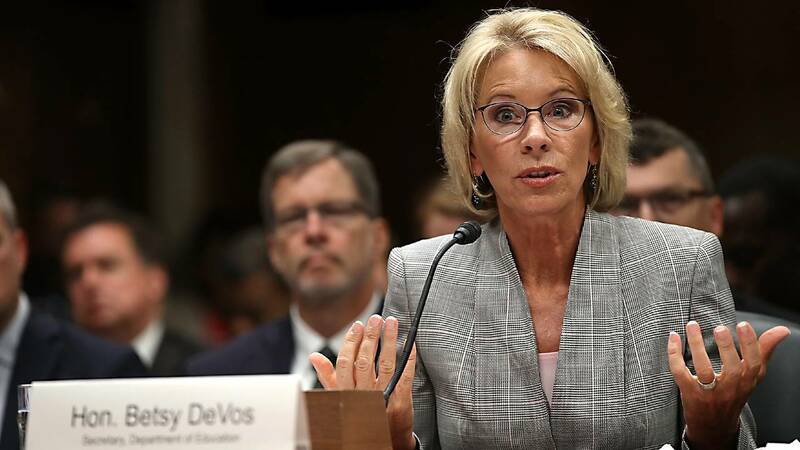 (CNN) - The Department of Education has finalized a reorganization plan that has at times drawn the ire of Congress and agency officials, according to an internal email obtained by CNN and confirmed by an agency spokeswoman. The reorganization packages, split into five parts, were all approved following a meeting Education Secretary Betsy DeVos had with President Donald Trump and Vice President Mike Pence last week, according to the email, which was sent to department staff on Monday. The agency reorganization will be effective January 6, but the email states the changes "will take several months to implement fully." The reorganization is part of "an administration-wide commitment to making government more efficient, effective, and accountable," the email states, but provides few other details, referring readers to an internal website. Department spokeswoman Liz Hill told CNN that no full-time employees would be cut from the agency as a result of the new structure. Instead, funds "are being reallocated and positions are being shifted to better align the department's staff to execute on our mission." The internal email did not include specifics about how many positions will be cut or how much money the reorganization structure will save the agency. Hill did not provide specific numbers either. All offices affected by the reorganization are expected to have an all-hands staff meeting this week, the email states. In June, the White House announced a plan to merge the Department of Education with the Department of Labor to become a combined Department of Education and the Workforce, but Congress has not addressed the proposal. The new Education Department structure consolidates a number of offices within the agency. The Office of the Secretary will merge with the Office of the Deputy Secretary. The Office of the Chief Financial Officer will merge with the Office of Management to become a new Office of Finance and Operations, according to the email. The new Office of Finance and Operations will also take on certain responsibilities of other agency offices including the Office of the Chief Information Officer, Office of the Deputy Secretary, and the Office of Planning, Evaluation and Policy Development, according to the email. The Office of Innovation and Improvement will also "integrate" into the Office of Elementary and Secondary Education.